If anyone thought the riots were the work of boroughless scumbags working themselves across London like a rats’ invasion of the Monopoly board – wrong. Tonight I saw people I know who live here in Bow laugh and egg each other on as they took turns to dart under a wrenched open shutter into a designer clothes shop on the Roman Road called Zee & Co – and emerge, scarves around their faces, arms full of booty. One by one – black, white, Bengali, boy, girl, most of them teenagers – they went in and out as mates laughed and cheered across the street. I followed one lad, a black boy with a barely grown striped beard in a yellow polo shirt, thinking he’d walk to a van waiting somewhere nearby. 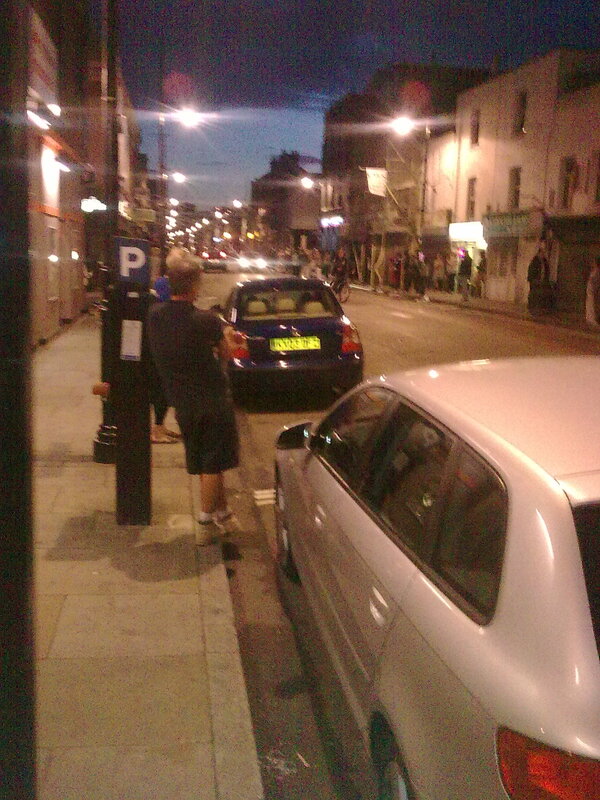 No, nonchalantly, at about 9pm he strolled about 50ft up the road and turned left into a flat above a furniture shop. There was a Turkish bloke wearing a red cap at the door smirking as he let him in. The black boy went upstairs, dumped his loot and joined friends cheering from a first floor window. More followed him in. These thieves live here. And so do the people watching them. Do they give a toss about the area, one where a year today the eyes of the world will be watching? No, of course not. This was their fun-filled Looting Olympics. I watched all this in Tower Hamlets for about an hour. In that time one police van drove past. It slowed down, put on its blue lights and then sped off. What could they do? 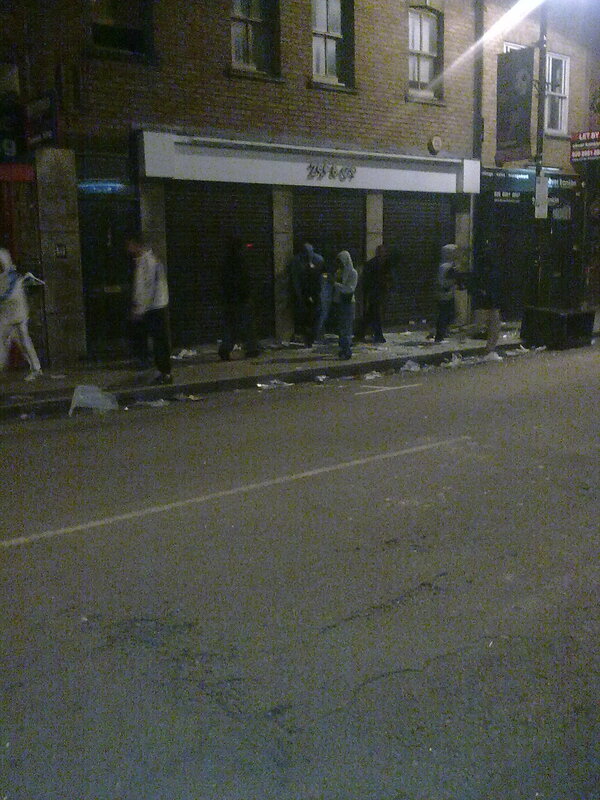 This was just one shop; along Bethnal Green Road, riot police had been deployed. “I hear Zee’s having an open sale,” and, “I got me a load of Stoney hats, bro” [he meant Stone Island designer hats]. 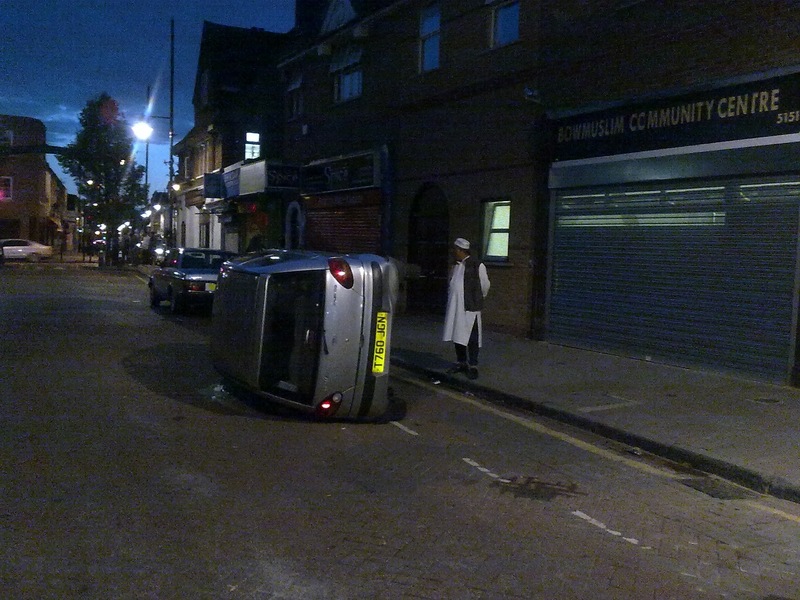 The car had been overturned by outside the local Muslim Community Centre. One of the elders there said a gang of black, white and Bengali youths had done it. He said they had been after the parking permit displayed on its windscreen. Repeat: this is less than a kilometre from the Olympic Stadium. Mindless doesn’t begin to describe it – but what else does? Tower Hamlets residents will be deeply concerned by the outbreak of rioting and street violence across London. This violence is totally unacceptable. As your Mayor I urge everyone in our borough to remain calm. We are one community, one Tower Hamlets; and it is the responsibility of all us as neighbours to look after each other, our local area and our services. The council is working around the clock with community leaders to ensure that this message is taken directly to our young people. It is also the responsibility of the police to deal with crime in a way that wins the trust of local communities. That job is being made much harder by the cuts to community policing being forced through by the Mayor of London and the government. We need a local police service that remains in touch with, and understands the community. We do not yet know all the facts behind the outbreak of these disturbances. I believe when full investigations are carried out one of the factors identified will be a sense of anger among our young people that they have been forgotten. Government cuts are hitting our youth the hardest. Youth unemployment is rising, while youth services are being destroyed. When opportunities for our young people are closed off, it is inevitable that frustration and alienation will increase. It is a recipe for disaster. Young people should not target their anger at their own community. It is not our local shopkeepers and businesses that are to blame. We must have a genuine debate about how our society is being fractured and divided by an economic crisis made far worse by government policies. Here in Tower Hamlets my administration will do whatever it can to show that there is another way; by protecting youth services, delivering jobs for local young people, increasing community policing, and showing that they have a future ahead of them that is not worth throwing away. Well Mr Rahman the first thing you did when you got elected was loot the tax payers purse, refurbing your office and spending thousands on flowers for guests each month, grabbing money where ever and whenever you could for grateuious purposes. These boys/girls are just emulating a mentality that you yourself endorse. You should be ashamed of yourself. Please spare us your self-advertising, self-important BS; we already read that rubbish in the ‘free’ newspaper you force through our letter boxes every week. Perhaps if you want to save money in these times of much needed austerity your propaganda machine (including the TH newspaper) can be the first thing to go. Stop putting commercial interests (for example: closing huge chunks of Victoria Park for most of the summer for events, at the distress of the local residents) and your vanity before the residents of TH. Oh look, the odious Rahman turning up trying to point the finger at anyone other than himself and his administration. Let’s all laugh at the money-grabbing, corrupt, deceitful, fraudulent, self-interested ‘Mayor’. Trust me Rahman, while I loathe those rioters had they been attacking your house or offices then I wouldn’t have hesitated to join in. I live near Roman Rd,not heard anything but even more sad now that I read this and that in Bethnal Green. Good to read our mayor’s comment but please be more vocal. why isn’t the TV showing mayors like him and other community leaders giving messages like his? Well done Ted, this is the type of journalism we expect from you. We need to see more of this and less of politicians misusing you. For the record; usually our dear friend Peter Golds jumps at every opportunity to stir up trouble, but when there is a real need for him to support the community and take up leadership he is nowhere to be seen or heard from. However if this issue was vaguely related to Lutfur, Peter would have been the first to post on this blog. Politicians such as Peter are only interested in divisive politics and don’t really have the interest of the community at heart. So Ted it’s time for you to wake up and stop giving such politicians unnecessary platform to spread their negative agenda. If Cllr Golds is anywhere he is in his own ward looking after the well-being of his constituents. A family was attacked on Spindrift Road and a number of cars burnt. The Tesco’s at Crossharbour was trashed and burnt like the one in Bethnal Green (a disturbing trend in itself). People are afraid and you “Mini-me” are making snide political attacks, just like your boss Lutfur in his so-called Mayoral statement. What a pathetic posting from mini-me. Perhaps he should explain why rogue landlords such as Yusuf Faradia should not be exposed. Or why the unnecessary expenditure by the mayor on plush offices and expensive cars should not be criticised. Or why the mayor should be allowed to use Tower Hamlets paid staff for political campaigning purposes. Or why others should post under their own name when (s)he posts anonymously. Last evening I watched an hour of the BBC’s reporting of these thugs and hooligans destroying their own nest. The (lying, bloody left wing) seemed to think there was some excuse for all this criminality and kept calling these animals either “demonstrators” or “protestors”. I didn’t see any placards. I did see the BBC interviews where they tried to make the police “admit” that it was all their fault. I also saw other interviews where “community leaders” (wherever they found them from, probably the BBC canteen) blaming the government for these laughing looters. Whatever happened to the Riot Act? The trouble is that the police are too nice these days with the BBC constantly nit picking and waiting to pounce. on August 9, 2011 at 3:20 pm You couldn't make it up! A jewellers (next to the chemists) in the eastern (market) section of Roman Road was broken into and looted last night. SOCO officers crawling all over it this morning. Lots of shops closed with shutters down – which I gather is a pattern repeated across the borough. Mr Jeory, there is no doubt that you are racist. Why do you have to describe the looters as blacks, whites and Bengalis? They are young people. Simple as. Is there a need for racial profiling? No mainstream media have described the looters/rioters as blacks, whites and so on – not even your colleagues in the right-wing press. You said ‘black, white and Bengali’ youth. How can you be so sure they were Bengali? Just because they are Asian and from Tower Hamlets, it does not automatically make them Bengali. It reveals your racist, stereotyping mentality that you make sweeping generalisations. Finally, if you are going to refer to the looters’ ethinicity, at least get it right. Bengali is a language and not an ethnicity. You mean to say Bangladeshi youth. Check any job application form or any official form and you’ll find ‘Bangladeshi’ in the diversity questionnaire. And please do not delete my comment. Defend yourself like a man if you can. Now, you are bringing out the victim card? After all these criminals have done to the TH area and you think it right to bring out the victim card on their behalf? Get any nice stuff while you were out “shopping”? Disgusting ‘contribution’ from “Newspaniard” accusing a commenter here of thieving. Comments and commenters on here should not be attacked like this. Why let this stay on here, Ted? Look how this thread has dried up – because of totally unjustifiable accusations like this. Also because of insults as the one below from “unit 101″/”force 101” – calling people dickheads when he isn’t attacking commenters on their written “English”. Beyond antagonism and into bullying. Doesn’t exactly encourage any reasonable person to contribute here, for fear of the cyber boot boys like “Newspaniard” and “force/unit 101”. It wasn’t me who started the insults and unprovoked attacks by using the “R” word to shut people up. Because he saw them dickhead. Anything you don’t understand about that? Why another name change to “unit 101” from “force 101”? Unit 101 of the Israeli Army. When in those 5 months did these 20-25 men have time to teach you “English”, as you say? And why have you taken their name? On the 2nd August blog, a commenter called Amir kept banging on about how he was a British/Bengali which, to me, seems to be a bit of an oxymoron but would answer where Ted got his definition from. Just look it up, he was using the locals’ own definition. I live in the area thought it was quite interesting that local Muslim boys were taking part in the rioting and looting. The press has been listing the decline of religious upbringing as one of the issues in youth violence and waywardness. But in this most holy month of Ramadan we saw Muslim youth take part, some congregating opposite the Mosque as I walked past- bandanas on their faces. I think this supports the idea that the problem is far greater than that and more deeply rooted in the society as a whole than in smaller communities. From what I can tell, the local Bengali boys were sticking the boot in as much as anyone else. Given their propensity to corruption and violence (google ‘Election of Rahman’ and ‘UAF Marches’ should you doubt either of these comments) I don’t find this hard to believe.